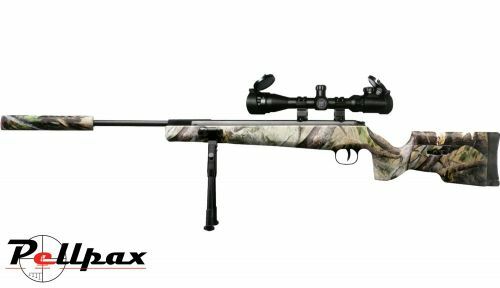 The Milbro Target Master is a full power air rifle powered by a spring and piston power plant to deliver high power levels with superb accuracy and shot to shot consistency. The action of the rifle is all made from metal for a very hard wearing and reliable rifle, and the finish to the metal work is a deep gun blue for a high level of quality. The barrel on the rifle is made from steel and is precision rifled, and then fitted with a fixed sound moderator on the end of the barrel to reduce the muzzle report. The stock is made from a strong polymer, which is available in both a standard black finish, or a camo version which fits into the wilderness very well. Features of this stock include an adjustable cheek piece, and side weaver rails for accessories, on which the included adjustable bipod fits onto. The trigger has a crisp and clean release on each shot and is protected by a sculpted trigger guard which further improves the great looks of this rifle. Scope and Mounts not included.